Description: Contents include 10 stories illustrated in b&w; 11 comic strip format stories in b&w and full-colour; a crossword (completed in pencil) and two pages with arts-and-crafts ideas. 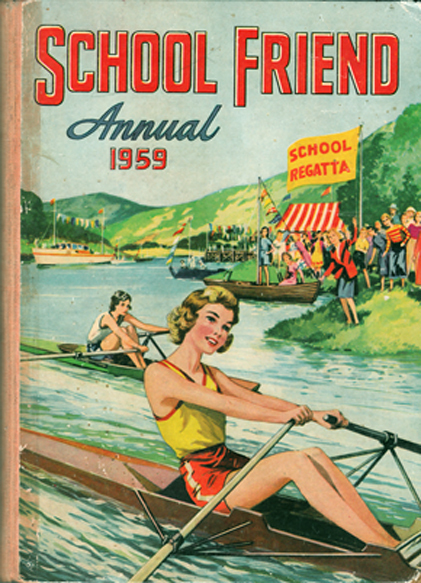 Wonderfully illustrated front pastedown and fep depicting a school fête scene in full colour. Lovely frontispiece of a ballerina signing autographs for a group of schoolgirls in her dressing room. A Thrilling Sports Day game on rear pastedown and rep.
Edgewear along front and rear boards. Front pastedown slightly damaged (but complete and with no loss). Not price-clipped – bears original price of 7/6. Pages have resisted tanning and are in very good condition: unmarked and free from foxing. Binding relatively tight. Measures 10.8″ × 7.6″ (27 cm × 19 cm). 4to. 160 pp.